Dialysis machines are used to clean wastes and excess fluids from the blood. The machines serve as an artificial replacement for compromised kidney function of patients who suffer from renal disease. Dialysis may be used for short or medium term care for patients with acute reductions in kidney function, or for long-term care of patients with chronic kidney failure, as a holding measure until a transplant can be performed. Dialysis machines operate on the principle of diffusion of solutes and filtration of fluids across a semi-permeable membrane. Substances pass from a fluid in which they are present in high concentrations across a membrane into fluids in which they are entirely absent or present in much lower concentrations. The pores of membranes used in dialysis machines are too small to allow blood cells and large proteins to pass through, but are sufficiently large to enable waste products to pass from the blood to a fluid called dialysate. Two types of dialysis processes are in widespread use. Peritoneal dialysis uses the peritoneal membrane of the peritoneum as a semipermeable membrane, with a special dialysate solution introduced into the abdominal cavity. A hemodialysis machine circulates a patient’s blood outside his or her body via tubes through a dialyzer, an external filter fitted with a semi-permeable membrane. The patient’s blood and the dialysate flow in opposite directions in order to maximize the impact of differences in concentrations of urea, creatinine, potassium and phosphorus, which are much too high in patients in renal failure, and low or entirely absent in the dialysate. Dialysate is constantly replaced to ensure that differences in concentrations are maintained. The dialysate is rich in minerals and electrolytes, which filter from the dialysate into the blood using the same principle. A blood pump circulates the patient’s blood through the extracorporeal circuit and a heparin pump ensures that the blood flows freely, without clotting. 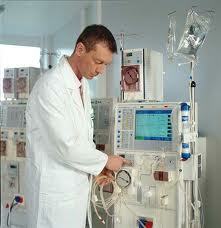 There are many producers and vendors of hemodialysis machines. Major suppliers include Gambro, Fresenius, Baxter, Nipro, NxStage, B Braun and Bellco. Home hemodialysis is widely used in the US by people with stage 5 chronic kidney disease. B Braun machines are used in dialysis centers as well as at home. The Fresenius Baby K machine is similar to a standard machine, but smaller and easier to use. The NxStage System One machine is more transportable than the other options, giving patients a good deal more freedom.